Every installation is special and is probably the highlight of the lodge’s season. Sometimes circumstances make it extra special, and this was one of those occasions. The WM George Calderbank was installing his younger brother Stephen into the chair of King Solomon of Arrowhead Lodge of Freedom No 8500 at Ashton Masonic Hall. Stephen is a light blue who has passed through all the offices to reach this elevated position. David Ogden (left) congratulates Stephen Calderbank on attaining the Chair of King Solomon. David Ogden, Assistant Provincial Grand Master, was delighted to attend as the principal guest and he was accompanied by fellow grand officers Geoffrey Porter (Wigan Group Chairman) and Roy Ashley supported by acting Provincial grand officers Barry Dickinson (PrJGW), Chris Maloney (PrGSuptWks) Eric Bailey, Dave Dutton (both PrSGD) Geoff Whittle (PrGStwd) and group officers John Selley (Wigan Group Vice chairman) and Ian Green (charity steward). Grand officer John Roberts was also in attendance and on duty as DC of the lodge. 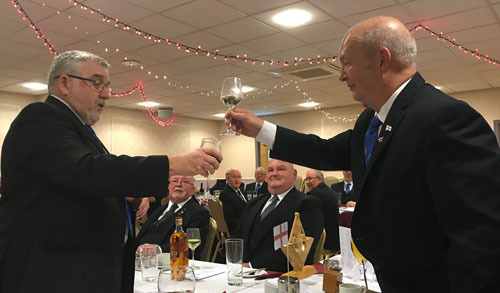 WM George conducted the initial business of the lodge, and before receiving the distinguished guests thanked the members for all the support they had given him during his term of office. 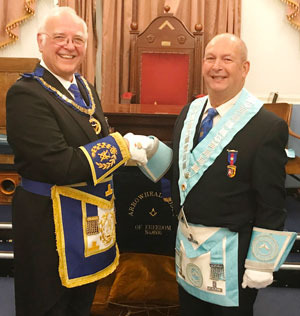 He had enjoyed a fantastic term and thanked everyone not only for their support in the lodge and after proceedings, but also on the social front. George then went on, with the assistance of lodge members, to install his successor. Pictured from left to right, are: brothers Stephen and George Calderbank. David was treated to a delightful ceremony in which George performed a heartfelt installation ceremony and Stephen was put into the chair in fine style. The team were ably led by director of ceremonies John Roberts. Other brethren of the lodge taking part included Rod North, who presented the new WM. Three junior brethren, Dave Bliss, Dave Hatton and Mark Grundy presented the working tools in the three degrees impeccably. 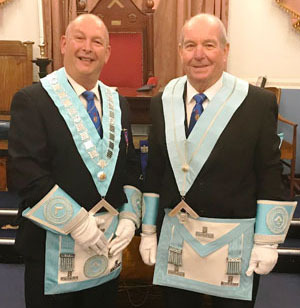 Bert Stockley delivered the address to the new WM and David Ogden to the brethren of the lodge. Once complete, it was David’s cue to rise and bring greetings on behalf of the Provincial Grand Master Tony Harrison, who he said would have been greatly impressed with the quality of the afternoon’s work and brought congratulations to both the new and installing masters. David went on to give further congratulations to all those who had taken part. In particular he saw fit to single the installing master, George and the brethren responsible for delivering the working tools. Cheques for over £2,000 were presented to David on behalf of the lodge to be given to The Masonic Charitable Foundation, Alzheimer’s, Guide Dogs for the Blind, Mind, Veterans in Sefton and Ashton Masonic Properties. David thanked the lodge brethren for their generosity on behalf of the recipients. A fine festive board followed and during which Paul O’Brien entertained everyone with the musical rendition of the master’s song, in his own inimitable style, accompanied by Frank Laird. Paul O’Brien (left) toasts Stephen with a song. Stephen is married to Moira and blessed with 3 children, 7 grandchildren and a Springer Spaniel. all of whom live within 2 miles of his home residence in Crank. He is semi-retired and now works as a Psychotherapeutic Councillor and Life Coach with his own practice in St Helens, having previously worked full time supporting former military men and women with PTSD recovery programmes and other mental health related issues. He served for 25 years in the Royal Naval Reserve and achieved the rank of Chief Petty Officer (Mine Warfare). He qualified as a Ships Diver in 1973. He now is President of HMS Eaglet Old and Bold Affiliation and relishes the opportunity to catch up with former shipmates at formal ceremonial and social events, many of whom were present for his special day. He has been to Buckingham Palace, meeting Prince Andrew as recognition for being part of organisations supporting veterans with needs along with a further face to face visit in his workplace by Prince Edward in 2017. Stephen aims to keep the good ship Arrowhead on an even keel, having much fun along the way. Pictured from left to right. are: Ian Green, Eric Bailey, Chris Maloney, John Selley, David Ogden, Stephen Calderbank, George Calderbank, John Roberts, Barry Dickinson and Geoff Whittle.